Onjay is from the northern part of the Philippines in a province called Cavite but has been living and working in Malapascua Island as a scuba diving instructor since June 2011. She’s a graduate of the University of the Philippines-Diliman with a degree in Bachelor of Science in Tourism. Onjay started diving in 1999 and became a diving professional in 2010. She has dived outside the Philippines in Thailand, Indonesia, and Maldives, and in the Philippine’s best dive destinations such as Anilao, El Nido, Coron, and Panglao Island. Onjay’s expertise are Peak Performance Buoyancy and Emergency First Aid Instructor. Has been part of Project AWARE, a coral reef conservation project in Malapascua. Jollibee is originally from Cebu City but she grew up and lived both in the city and in Malapascua Island. 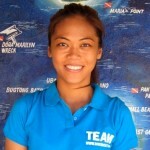 She has been with Dive Society Malapascua since June 2013. Though Jollibee’s name is similar to a famous fast-food chain in Philippines, her name is in fact a combination of the first names of her father and mother, Julito and Bebbie. Jollibee has an Associate Degree in Office Information System. Her husband is a dive master in the island and they have a son. Jollibee’s father is a carver of wood souvenir thresher sharks sold to tourists that comes to Malapascua Island. 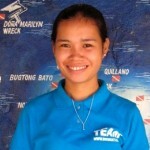 Jollibee, with her calm and friendly demeanor, will be there in the dive center to answer inquiries and assist guests. Born in the nearby island of Carnaza to a fisherman family. Jera, as a kid would join his father to go fishing on their small boat. 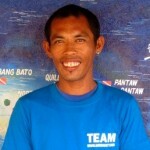 He moved to Malapascua in 2010, then in 2011 Jera learned how to scuba dive. 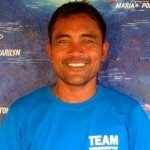 Jera is a pioneer of Dive Society Malapascua starting as a speedboat captain and a compressor man. Now Jera is of one of two dive masters in his family, his older brother being a dive master working also in Malapascua Island. Jera’s very fond of watching very small underwater creatures like squat lobsters, crinoid shrimps, spider crabs, urchin shrimps, whip coral shrimps, crinoid and coral crabs, and pygmy seahorse. Jose learned to scuba dive in 2009. A pioneer of Dive Society Malapascua, Dodo, as we call him in the dive center, is one of two original dive masters of Dive Society Malapascua. He will be happy to show you his favorite underwater creatures like nudibranch, frogfish, harlequin shrimps, ornate ghost pipefish, pygmy seahorse and many more. Dodo has a wife and together they have a son. Another baby for Dodo and his wife is on the way this month of July. When Dodo is not at work, he enjoys fishing with his brothers. Rudolfo or Tata as we call him is from the province of Leyte. 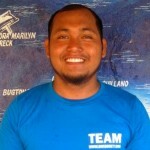 He already has 9 years of experience as a boat captain when he started working with Dive Society Malapascua in October 2013. Being a boat captain runs in their family. Tata has two brothers, who are also boat captains for other dive centers here in Malapascua. When the super typhoon Yolanda hit in Malapascua Island in November 2013, Tata was manning Makoto assisted by his boat crew Jayky and Moloy. Makoto was one of the very few lucky pump boats that survived the super typhoon with only a little damage. Tata has a wife and they have two daughters. Jayky was born in the northern part of Malapascua Island in a village called Bool. Their family’s main livelihood is fishing. 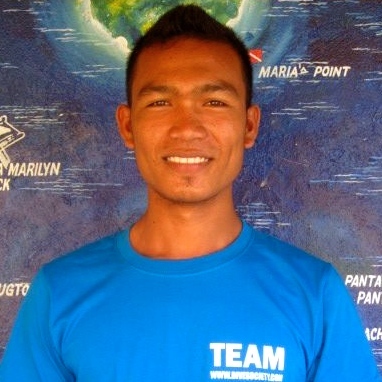 He started working in Dive Society Malapascua in December 2012. Soon after working with Dive Society he learned to scuba dive. He is now working his way to be one of the center’s dive masters. Chocolate Island has become Jayky’s favorite dive spot for the frogfish, harlequin shrimps, and flamboyant cuttlefish he gets to see in the island. Jayky has a wife and they have two daughters. When not at work Jayky does carpentry and masonry work at home or plays basketball. A local of Malapascua, born in a village in called Tawigan. Marlito is from a family of fishermen. 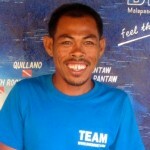 Moloy, as we call him here in the dive center, is a pioneer of Dive Society Malapascua. 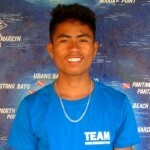 He learned to swim at age 10 and is very comfortable to swim on big waves but Moloy still has to try scuba diving. Moloy has a wife and they have 3 daughters and a son. Moloy will be there to assist you on our boat Makoto as you get ready for your dives and when you come out of the water to get back on the boat. 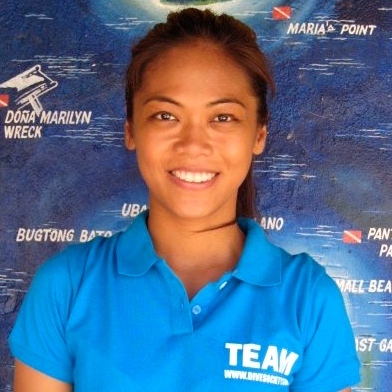 Dotche, the youngest staff in the dive center, started working with Dive Society Malapascua in September 2013. He was born in a village called Langub on the northern part of Malapascua Island. At age 8, Dotche learned how to swim. He learned scuba diving in 2013. 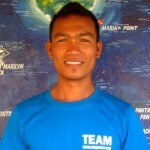 Dotche, like our other boat crew Jayky, is also on his way to become a dive master. Asked what is his favorite dive site, Dotche says that Monad Shoal is his favorite dive site for the amazing pelagic thresher sharks. When not at work, Dotche can be seen riding around Malapascua Island on his motorbike.